Wood stork nest totals in Georgia fell slightly from last year's record high, but surveys still show the tall, bald-headed wading birds making a comeback. 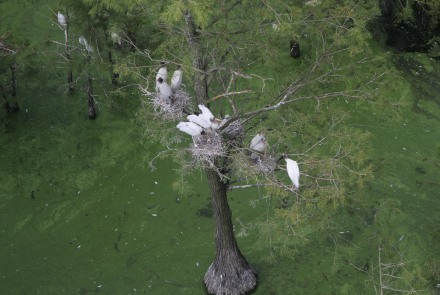 Wildlife biologist Tim Keyes, wood stork survey leader for DNR’s Nongame Conservation Section, said aerial and ground surveys in May and June estimated 2,496 nests in 22 colonies, from Chatham to Mitchell County. Follow-up surveys, including flights this month, documented high productivity for wood storks, which were down-listed from endangered to threatened under the Endangered Species Act last year. The nest count is a drop from the record-setting 2,932 nests documented in 2014, but tops the previous two years and is consistent with long-term recovery trends. “It’s still a great year and a really good count,” Keyes said. Nearly all of the largest colonies were active this year and produced nests with multiple chicks. DNR and partners such as the U.S. Fish and Wildlife Service conduct the surveys. Wood storks nest in colonies, often with several of the stick nests in the same tree. Nests are built over water, a setting in which alligators unwittingly help protect the eggs and chicks above from raccoons and other predators. Georgia colonies this year ranged in size from 442 nests at Harris Neck National Wildlife Refuge to 15 nests at a St. Catherines Island site. Colonies were documented in 12 counties: Brantley, Brooks, Camden, Chatham, Cook, Glynn, Jenkins, Liberty, McIntosh, Mitchell, Thomas and Worth. 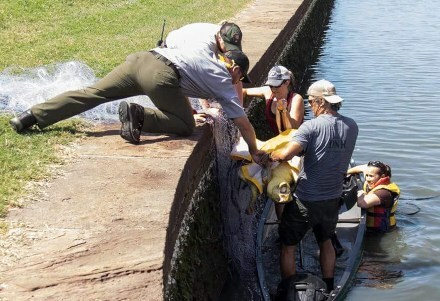 A manatee rescued from a warm-water plant outfall on the Savannah River in December may have suffered another mishap. A boat hit the satellite tag trailing the manatee in Florida’s Matanzas River on July 3, damaging the device and knocking it loose. It’s not known if the manatee was hurt or killed. SeaWorld Orlando nicknamed that manatee Clay, after DNR wildlife biologist Clay George, who helped organize the rescue (Dec. 18 Georgia Wild, plus video) and leads marine mammal research for the agency. Nicknames also have been given to five manatees tracked in a DNR-led project this summer (“Project maps manatees,” June 18). 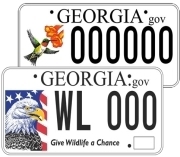 Project partner Sea to Shore Alliance is calling manatee TGA008 Tylerrose; TGA009 is Lanier (after 17th century poet Sidney Lanier, writer of “The Marshes of Glynn”); TGA010, Mercer (for Johnny Mercer, Savannah-born singer/songwriter and founder of Capitol Records); TGA011, Charles (Ray Charles, need we say more); and, TGA012 is Duo (re-tagged after its first tag malfunctioned; thus, do-over). Please report sightings of tagged manatees to DNR at 1-800-2-SAVE-ME (800-272-8363). 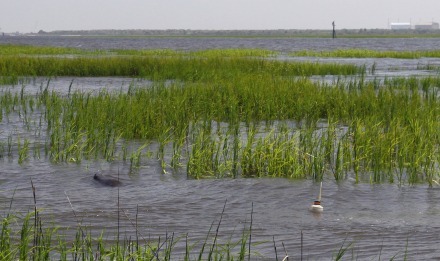 Note the time, date, place, tag color and whether other manatees are present. Do not touch or harass the manatee (they're protected by federal and state law) or touch the tag. The newly released FloraQuest app by the University of North Carolina Herbarium covers a 14-state area and some 7,000 species, or – as advertised – all you need to know about naturally occurring plants in the Southeast and Mid-Atlantic U.S.
Nongame Conservation staff recently surveyed stretches of the Flint River and Spring Creek in south Georgia for rare fishes, capturing an unknown species of sand darter discovered in Georgia in 2013. Another crew sampled for federally petitioned mussels in the Oostanaula River watershed between Rome and Calhoun, finding, among other species, live Coosa creekshells in Camp and John’s Creek watershed. 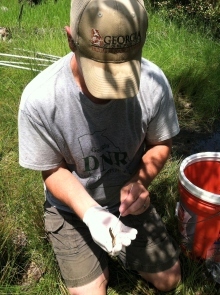 Twenty striped newt larvae and adults dip-netted from a breeding pond at Fall Line Sandhills Wildlife Management Areas were swabbed recently for Bsal chytrid, a disease devastating Eurasian salamanders, and skin samples taken for genetics research. Because some Eurasian newt species are sold as pets in the U.S., concern about the pathogen being introduced here has prompted monitoring of potentially vulnerable native salamanders. Fall Line Sandhills WMA near Butler harbors the only known healthy population of western striped newts, a candidate for federal listing. Learn more about Fall Line’s role in striped newt conservation in the Nongame Conservation Section annual report. 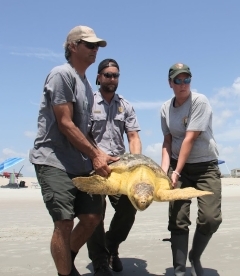 A tip led rangers to the Brunswick man charged this month for poaching sea turtle eggs on Sapelo Island – for the second time in two years. DNR Law Enforcement posted this account, with photos, after the July 8 arrest of Lewis Jackson Sr., who faces revocation of his parole, plus theft-related charges. More names in the news: Longtime DNR educator Sheila Humphrey of Smithgall Woods Regional Education Center is retiring, having taught more than 150,000 children and teens about wildlife conservation and the environment. Cpl. Jason Roberson of DNR’s Law Enforcement Division has been named Officer of the Year by the Southern States Boating Law Administrators Caucus, which makes Roberson, already selected the state’s top boating officer, one of three finalists for the national award. The Georgia Forestry Commission honored Jim Gillis, a commission Board of Directors member for 38 years, by naming the agency’s headquarters auditorium in Dry Branch after him. A paper titled “An evaluation of streamflow augmentation as a short-term freshwater mussel conservation strategy” and written by Nongame Conservation Section's Jason Wisniewski and Andrew Gascho Landis and the U.S. 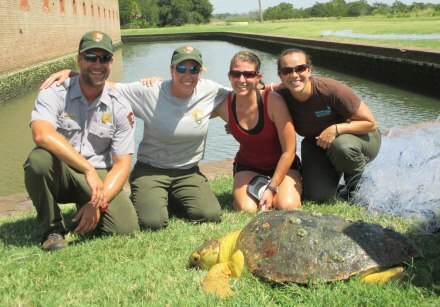 Fish and Wildlife Service’s Sandy Abbott will be published in River Research and Applications. Dirk Stevenson of The Orianne Society wrote this thoughtful column about fellow herp enthusiast Davey Jones of Ridgeland, S.C., after Jones died recently.